NatSCA is pleased to invite applications to this year’s Bill Pettit Memorial Award. Up to £2,000 of grant money, is available to NatSCA members this year to support projects including the conservation, access and use of natural science collections. Charles Arthur William ‘Bill’ Pettit (1937-2009) started his career with the National Institute of Oceanography but moved to the Manchester Museum in 1975 to become Assistant Keeper of Zoology. In his time at Manchester, Bill worked tirelessly for the collections and was instrumental in projects such as FENSCORE as well as numerous publications. It is in recognition of his commitment to natural science collections that we would like to offer this annual award. 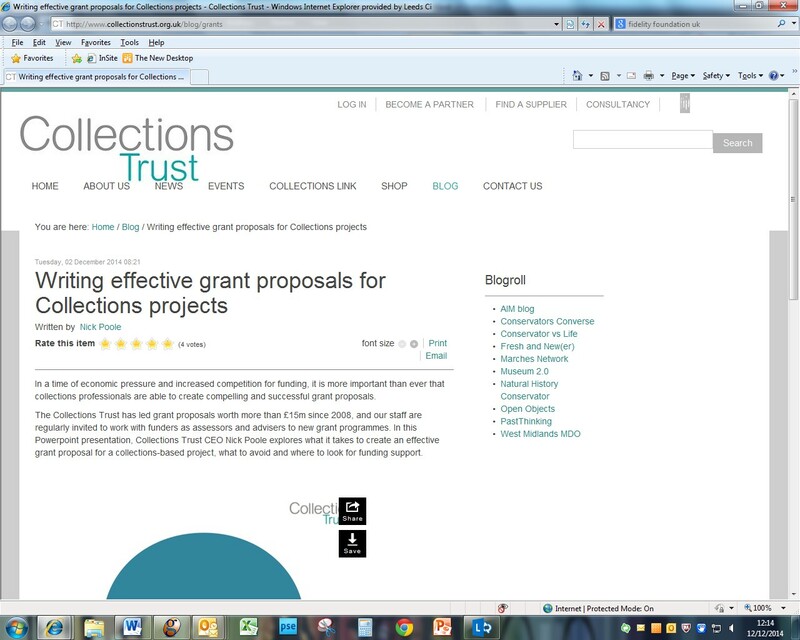 Projects will be assessed against NatSCA’s mission to promote collections care, use and access of Natural Science collections. We are looking for projects that can be delivered on time and budget, leaving a tangible legacy. Each project will be considered on its own merits by the NatSCA committee and the committee’s decision, including not awarding any money that year, will be final. The 2014 Geology Curators’ Group conference and AGM dealt with how to raise money for natural science collections. The first speaker of the day was Nick Poole, CEO of the Collections Trust. He gave a great talk on where to look for funding, and how to get it once you’ve found it. I’ve converted my notes from his talk below, and the slideshow of his presentation can be found here (the slides are comprehensive and brimming with tips). Nick Poole mentioned that the National Council for Volunteer Organisations has a good website for looking at who funds what, but after a bit of clicking around I couldn’t turn up anything particularly useful. If I’d had more time, and perhaps a membership number, I might have had a better experience. A great resource is Funding Central. This website allows you to search 4,000 potential funders using the criteria of your choice. At present the Heritage Lottery Fund (HLF) is in a cash-rich situation. However, they are concentrating on funding projects concerned with social utility or financial resilience. It’s quite hard to squeeze collections into those two titles. At the end of Nick’s slides he has listed several organisations that fund UK museum projects and collections (slides 39 – 45). It’s well worth taking a look at. If you are lucky enough to work in London, Kent, Surrey, Birmingham or Manchester, the Fidelity UK Foundation also funds museum projects. When considering applying for a grant, only ever apply for money for a project that is consistent with your museum’s aims, otherwise delivering it will be hell. Be prepared before the funding call goes out. Have a variety of projects ready to go, with need/scope/budget/supporting evidence available. RTFM (read the … manual). Produce a good solid ‘hearts and minds’ story, with hard evidence to back it up. Many funders have one eye on the press release. Believe it or not, the projects with great names do seem to get funding. Create drama and make it unique and compelling. Don’t focus on your collections as a problem – focus on the problem to which your collection is the solution. Understand how your proposal will be assessed. Don’t be insecure. Use the word ‘successful’. Don’t keep writing ‘if we get the grant’; write ‘when we get the grant’. Don’t bother with hubris (unless they ask for it). Avoid death by citation and focus on outcomes, not process. Build your reputation: become well known for delivering great projects. If at first you don’t succeed, then ask for feedback, adjust your technique, and try again.